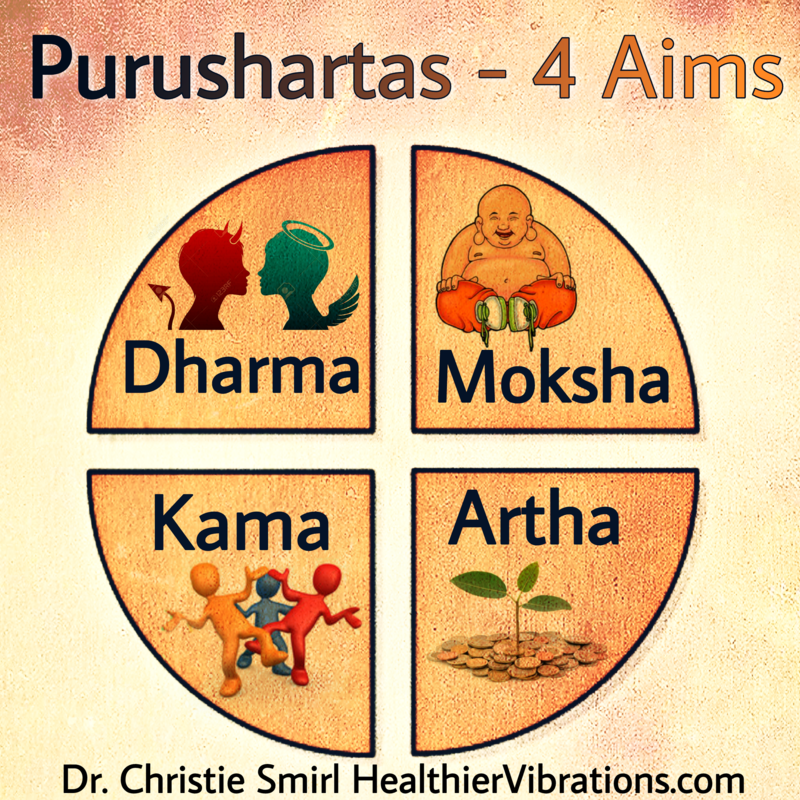 In yoga philosophy there are four aims of human life called the Puruṣārthas. Puruṣārtha means an “object of human pursuit”. The four puruṣārthas are Dharma (duties), Artha (prosperity), Kāma (pleasure) and Mokṣa (liberation). The Puruṣārthas are important to evaluate and measure to live a balanced life. If these four aims are looked at like a pie chart they can be seen as equally important in variable equations at different stages of life. The origins of the Sanskrit word Puruṣartha (पुरुषार्थ) comes from Purusha meaning “human being” or “soul” and Artha meaning “purpose”. Puruṣartha literally means “purpose of human being”. These four aims of Dharma, Artha, Kama, and Mokṣa are key concepts to balance for a fulfilling and happy life. Dharma represents duties, obligations, virtuous conduct and righteous living. Dharma includes duties of each individual that enable social order, virtues sustain harmony, and execution of one’s true calling. What are our individual values that guide our duties? How do those values and actions support one’s family, community and personal life mission? Dharma is often most emphasized, since if dharma is ignored, Artha (profit) and Kāma (pleasure) may lead to social chaos. However this is not to say that are not equally important in attaining Moksha. Perhaps it is better understood that proper Dharma leads to proper Artha which leads to proper Kāma then Mokṣa . Artha represents activities and resources that enable a prosperous life. Artha includes food, energy, wealth, shelter, career, knowledge and resources. A proper balance of arthas enable the pursuit of other goals such as Dharma, Kāma and Moksha. What resources are needed to fulfill one’s life purpose? Is the pursuit of Artha balanced or excessive fueled by greed? Kāma signifies desires, pleasure of the senses, enjoyment of life, and love. Everybody desires comfort, love and pleasure in life. While fulfilling Dharma (duty) and attaining Artha (resources) one should stop and smell the roses. Kāma can be incorporated into Dharma and Artha when our life mission is in alignment and our environment is conducive to personal development leading us to Mokṣa. Mokṣa is liberation from suffering and emancipation from saṃsāra. Mokṣa represents personal and spiritual freedom, self-realization and enlightenment. The yogic philosophy of the Puruṣārthas help guide our life pursuits with moral guidelines, grounded prosperity, pleasure and happiness. Sit down at least every six months and pie graph all four aims. See if there is balance. Check if adjustments need to be made is values, responsibilities, finances, resources, pleasure and life mission. Sometimes there’s more work to be done and sometimes there’s more fun to be had. Check how each aim modulates the other and live a beautiful life. About: Dr. Christie Smirl is a Doctorate of Ayurvedic Medicine, Nurse Practitioner, Master of Science, E-RYT Yoga Teacher, Yoga Teacher Trainer YACEP, Reiki Master/Teacher, Tantric Energy Healer and Musician. For more information about conscious living, yoga, nutrition, Ayurveda, yoga teacher training and holistic health adviser training programs please visit Dr. Christie Smirl’s website HealthierVibrations.com, connect on social media at the Healthier Vibrations page on Facebook and follow her education site on WordPress. To enjoy her meditation music visit here.